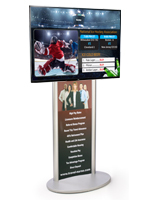 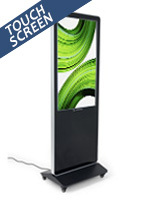 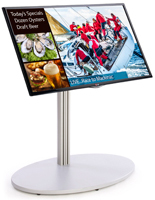 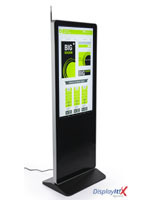 Looking for digital signage displays to promote business and services or to entertain or inform patrons? 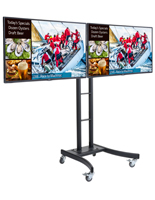 Found in restaurants, bars, retail stores, office board rooms, service organizations and at trade shows, multimedia marketing setups are based on flat screen televisions with internal media players. 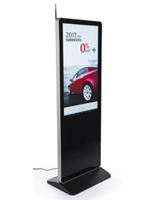 Digital signage displays, also known as electronic advertising systems, allow businesses and trade show professionals to create and show dynamic presentations that draw the attention of passersby. 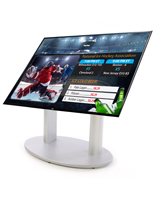 The differences in each system include screen size, stand finish, mounting method and, of course, content. 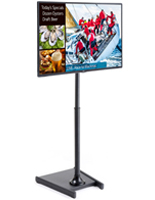 While commercial-grade digital signage displays can capture the attention of and inform visitors, potential customers and clients, they can also be used for non-commercial purposes in schools, churches, information centers, lobbies and transit concourses. 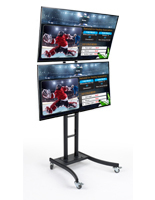 This type of scalable system is perfect for use in almost any industry, from hospitality to retail to professional to educational and even industrial. 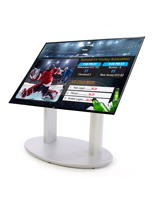 What features are included in electronic advertising systems? 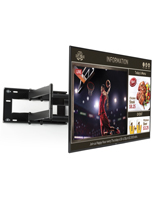 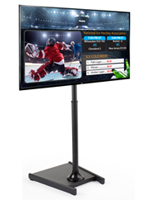 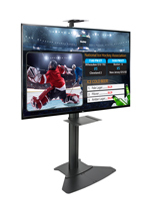 Our digital signage displays include professional-grade 42" - 55" LG® monitors with two-year manufacturers' warranties. 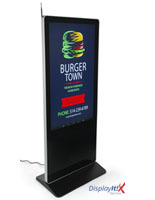 Each electronic sign board features HDMI, USB, composite, component and cable ports and connectors. 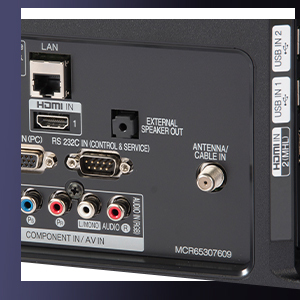 This allows for a wide range of external devices that can be used to play and replay audio and video from DVD, Blu-Ray, live TV or cable feeds and other sources. 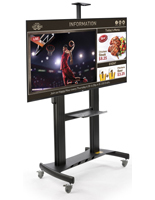 USB ports allow users to easily upload content via a portable drive and replay it on these multimedia advertising systems. 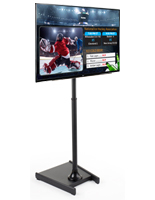 Each display comes with an internal media player that uses template-based content management to showcase video playback or live feeds with customizable text and audio files. 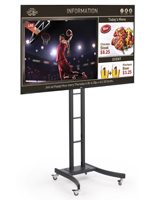 This type of presentation can be used to show specials and pricing in restaurants or bars, sales data in offices, new product image slideshows in car dealerships and other retail environments, service information in professional offices, merchandise showcases at trade shows, song lyrics at churches and much more. 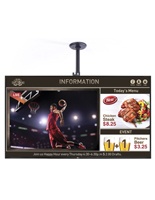 Our economical electronic advertising systems & multimedia marketing signage displays come with free access to a customizable content management system with more than 30 pre-made industry-specific templates. 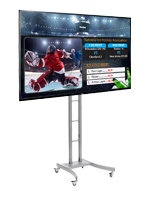 Easy-to-update templates for financial institutions, retail stores, hospitality vendors, churches and schools include specifically designed layouts for banks, automotive dealerships, hotels, restaurants, clothing stores, liquor stores, private schools, theaters and many, many more. 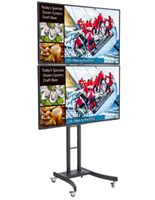 From in-store digital advertising to wayfinding directories to product information showcases, our easy-to-update multimedia marketing content solution is a great way to attract, and engage, customers and passers-by alike. 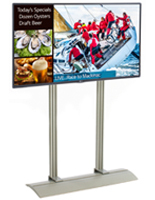 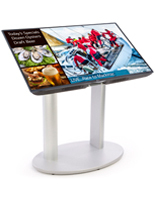 With USB cloning technology, presentation settings can be copied to other interactive signs and media players as needed for scalable in-store digital advertising or information dispersal. 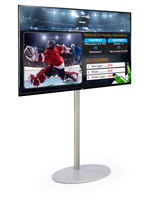 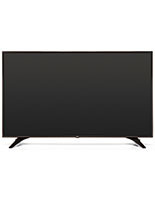 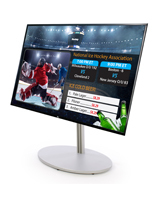 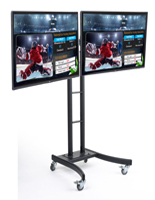 In addition, the system can remotely control up to 50 other televisions via LAN connection for consistent content solutions across networked displays. 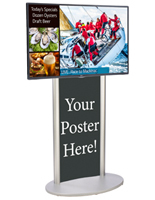 Several styles of signage display fixtures are available. 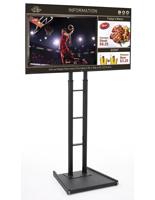 Some feature simple stationary posts while others have dual supports with additional advertising space for printed promotional posters. 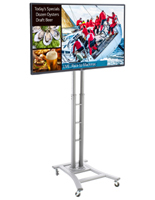 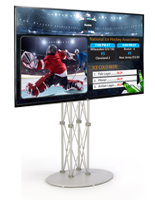 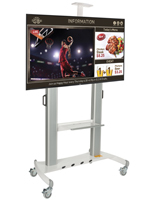 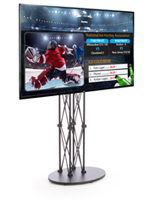 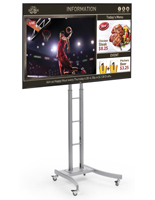 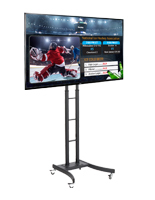 Wheeled models are great for adding extra mobility to electronic advertising systems, while pop-up truss-style stands assemble and break down easily to fit into a handy carrying cases, making them ideal for trade shows. 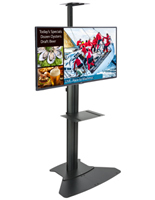 Wall mounting arms and ceiling mounts save floor space in bank, restaurant, hotel and school lobbies as well as commercial operations such as retail stores or service businesses. 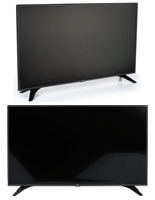 All flat panels sold here are compatible with a number of different mounts. 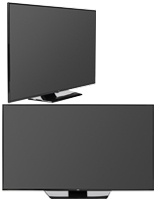 VESA, the Video Electronics Specifications Association, created a set of sizing standards for fixture and television manufacturers that make it easier to match flat screens with brackets. 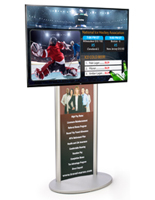 Our electronic advertising displaycome with free access to a customizable content management system with more than 30 pre-made industry-specific templates. 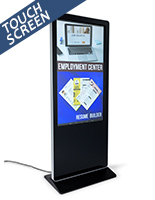 Easy-to-update templates for financial institutions, retail stores, hospitality vendors, churches and schools include specifically designed layouts for banks, automotive dealerships, hotels, restaurants, clothing stores, liquor stores, private schools, theaters and many, many more. 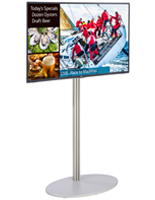 From in-store digital advertising to wayfinding directories to product information showcases, our easy-to-update multimedia marketing content solution is a great way to attract, and engage, customers and passers-by alike. 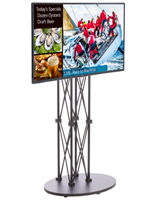 Several styles of signage display fixtures are available. 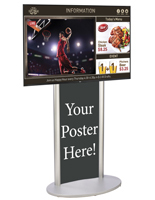 Some feature simple stationary posts while others have dual supports with additional advertising space for printed promotional posters. 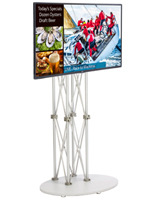 Wheeled models are great for adding extra mobility to in store digital advertising solutions, while pop-up truss-style stands assemble and break down easily to fit into a handy carrying cases, making them ideal for trade shows. 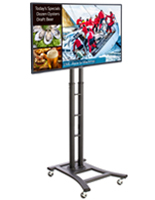 Wall mounting arms and ceiling mounts save floor space in bank, restaurant, hotel and school lobbies as well as commercial operations such as retail stores or service businesses.